When Should I Use the Humidifier Bottle on My Oxygen Concentrator? An oxygen concentrator is a device that takes in room air, processes it and provides an oxygen-rich output. It allows people who need supplemental oxygen, such as those with heart and lung problems, to get what they need without having to deal with tanks of compressed oxygen except as emergency backup. A concentrator plugs in to a standard home power outlet. It typically is able to run nonstop, though it should be checked periodically for correct operation. The humidifier bottle is used to prevent the patient's airways from getting too dry while breathing air directly from the concentrator. 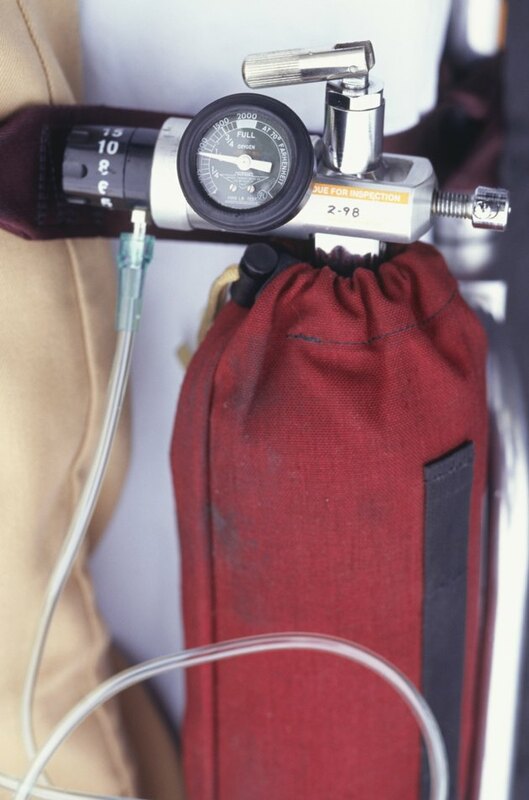 An oxygen concentrator replaces an oxygen tank. Normal air contains a variety of gases, but nitrogen and oxygen make up about 99 percent of the total. Most of this is nitrogen, with about 21 percent oxygen. A concentrator contains a filter material that separates oxygen from the other gases, and thus is able to produce a continual supply of oxygen-rich air. Patients use a long air tube that reaches from the face to the machine. This tube is typically long enough to allow the user to move freely while still connected to the apparatus. An oxygen concentrator may or may not have a humidifier bottle supplied with it. Whether you use one depends on a variety of factors, such as the condition for which you are using the concentrator and your personal preferences. The amount of humidity can be controlled by settings on the oxygen concentrator, but this is normally determined by medical personnel at the time the machine is dispensed to the patient. As a general rule, if the setup includes a humidifier bottle, it should be used at all times. In some cases, your doctor may prescribe that you use it only at night, in which case the doctor's recommendations should always be followed. Caring for the humidifier bottle on an oxygen concentrator is a relatively simple procedure, but it is important to do it on a regular basis to control the growth of bacteria. Without proper cleaning, harmful organisms can grow in the warm, moist environment of the humidifier bottle, and you can end up breathing these directly into your lungs. The bottle should be washed daily with soapy warm water, then soaked with a solution of vinegar and water to remove any deposits. Once it has been rinsed well and refilled with distilled water, it can be returned to its place on the concentrator. If you are using an oxygen concentrator without a humidifier bottle and you find that the inside of your nose feels dry and irritated, you may want to add a bottle to provide humid air. If you are already using a setup that includes a humidifier bottle but it makes you feel uncomfortable in any way, it may be that the level of moisture needs to be reduced so that you are breathing drier air. You should always discuss any changes with medical personnel before implementing them. Should You Use Distilled Water in a Humidifier?